Whether in the Gaelic ‘uisge beatha’ or in the Latin ‘aqua vitae’, whisky is the 'water of life’ and the drink has been enjoyed in Scotland since the 15th century when King James IV granted it a king’s commission. Since then this amber nectar has been enjoyed in every corner of the world but it is only in Scotland that it can be seen to be made and sampled in the many distilleries by visitors. Cupar hosts the Fife Whisky Festival from 8 - 10 March 2019. The annual Inverness Whisky & Gin Festival is 13 April 2019. The Spirit of Speyside whisky festival runs from 1 - 6 May 2019 and features numerous events in various venues around the north east of Scotland. The Spirit of Stirling Whisky Festival is on 10 - 12 May 2019 including whisky tasting and a food hall. New for 2019, the Highland Whisky Festival showcases distilleries along the North Coast 500 from 10 - 17 May 2019. On the Isle of Islay, the Festival Of Music And Malt takes place from 24 May - 1 June 2019 with traditional music, ceilidhs, whisky tasting and more. The Dramathon is a brand new race on 19 October 2019 following the Speyside Way from Glenfarclas distillery to Glenfiddich distillery. You can pick up the corresponding miniatures at the end of the race! Do the full or half marathon, 10K or relay race. The Dornoch Whisky Festival takes place from 25 to 28 October 2019 in the Scottish Highlands. The Glasgow Whisky Festival takes over Hampden Park stadium on 9 November 2019. There are over 100 malt whisky distilleries spread throughout Scotland and 48 of them have tours and visitor centres where visitors can enjoy the smells and traditions of the centuries’ old process. They are right across Scotland and on the Islands and each one has its own individual and distinctive taste which visitors can sample at the end of their tour. There are only a few main areas for producing whisky; from the peaty, smoky flavours of Jura and Campbeltown to the nutty stronger malts of the Highlands, to the fruity single malts of Speyside, where half of all Scottish whisky is produced and there is an unique Whisky Trail. All ages of visitors to Scotland can learn about the history of the national drink through the story-telling of the illicit stills hidden in the secret mountain glens and the gangs of smugglers being chased by the Redcoats and the Excise men. The new Scotch Whisky Experience near Edinburgh Castle provides all the sights and sounds of the history of whisky and also visit the Diageo Claive Vidiz Scotch Whisky Collection which is the world’s largest collection of Scotch Whiskies. The world renowned and unique Whisky Trail through Aberdeenshire and Morayshire is a 'must' for visitors as it allows the visitor to follow a defined trail of distilleries with different experiences. Also a trip to the Speyside Cooperage near Dufftown will interest the whole family where the only UK making of the barrels for the whisky industry can be seen at first hand. Scotch malt whiskies tend to be grouped within a number of regional categories, usually Speyside, Highland, Campbelton, Islay, Islands and Lowland, although sub-divisions are frequently made within these categories. Such classifications really exist for geographical convenience rather than stylistic simplicity. Within each classification there will be major variations of character, which is one of the factors that make Scotch malt whisky such a fascinating subject. Whisky is an iconic product in Scotland and it is deep into the culture of this country through being produced using the best of natural home grown barley and imbued with the distinctive special waters found in all parts of Scotland. Come and enjoy it. The current distillery was rebuilt in the late 19th century and its malt is very popular in France with the core expression being a’bunadh which is based on ex Oloroso casks. On the opposite side of the stream which runs alongside the Distillery there is a short walk to a waterfall called the Lynn Falls which is very popular with photographers and visitors alike. VisitScotland 5 Star Visitor Attraction. 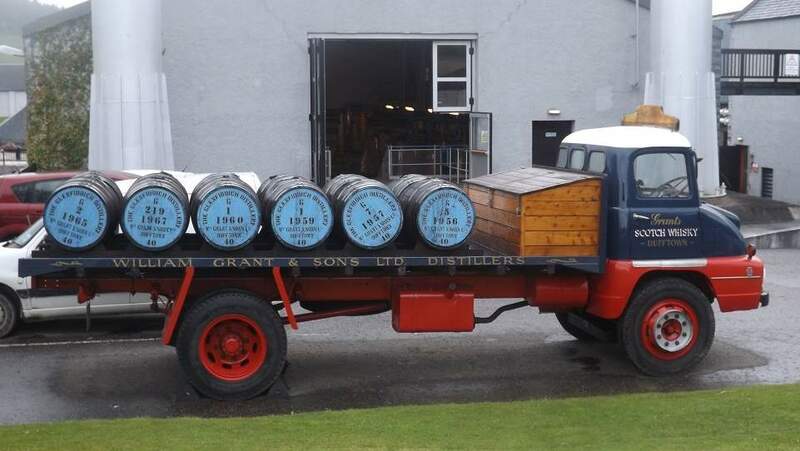 This distillery near the town of Forres was resurrected in 1989 when independent bottler Gordon McPhail acquired the Distillery from United Distillers. 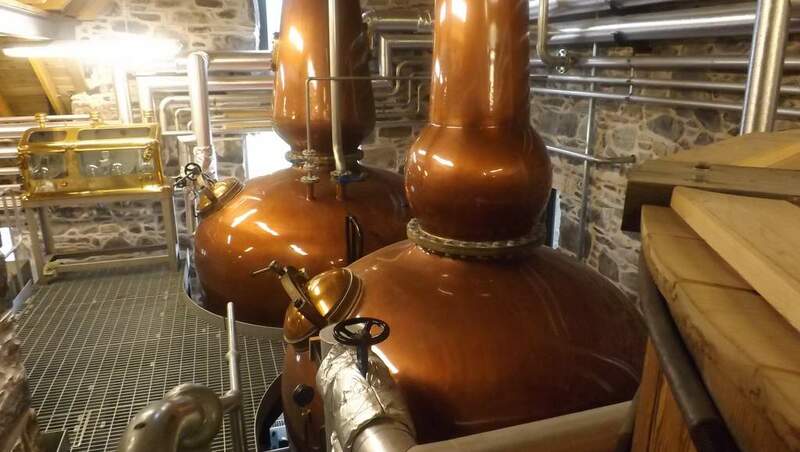 During the next 10 years the distilling equipment was installed and distillation began again. Despite being Speyside’s smallest distillery, it has been very active in producing prize-winning spirits on the international scene. Capacity 0.5 million litres and is open to visitors. Owned by William Grant & Sons, Glenfiddich was without question responsible for the growth in popularity of single malts around the world. Situated in Dufftown, along with nine other distilleries, including its sister distillery Balvenie, Glenfiddich was the first to market single malts to the mass market and is still the world's most popular brand. VisitScotland 5 Star Visitor Attraction. Situated between Huntly and Turiff, this distillery was reopened in 2002 by the BenRiach Distillery Company Ltd. Noted for its rich berry colour, derived from the maturation of the spirit almost exclusively in sherry casks, it has gained a reputation particularly among the young whisky drinkers around the world. Marketed as 'The single malt that started it all', Glenlivet owes its unique taste to many factors including the glen's remote location in Britain's coldest place. It grew into one of the world's biggest single malt distilleries and is now owned by Pernod Ricard. Illicit distilleries were once commonplace and visitors can today walk along many of the signposted Smugglers Trails in the area. VisitScotland 5 Star Visitor Attraction. Capacity 10.5 million litres and is open to the public. Established in 1824 on the banks of the river Spey, this distillery started life as a farm and was a staging post for cattle drovers who provided a lucrative market. Macallan is the third biggest single malt after Glenlivet and Glenfiddich. The new Visitor Experience opened in June 2018. Guided tours available. Founded in 1786, this is the oldest working distillery in Scotland and now home to one of the most famous whisky brands in the world - Chivas Regal. Arguably the most picturesque distillery in the Highlands with its pagoda roofs and water wheel. At weekends you may enjoy a ride on the Dufftown to Keith Heritage Railway as the Strathisla distillery is a short walk from Keith railway station. Visit Scotland 5 Star Visitor Attraction. Situated next to the Queen's Scottish residence of Balmoral Castle in Royal Deeside in Aberdeenshire, Queen Victoria bestowed the 'Royal' name after her whisky tour in 1848. The distillery takes its name from the mountain behind it and produces a 12 year old malt whisky from local barley and the water from the Scarnock Springs. It is owned by Diageo. VisitScotland 5 Star Visitor Attraction. Capacity 0.5 million litres and is open to the public. Situated at the foot of Britain's highest mountain, Ben Nevis distillery was founded in 1825 by 'Long John' McDonald and is one of the oldest licensed distilleries in Scotland. Now owned by the Japanese. Its visitor centre features the mythical giant Hector McDram. Coffee shop and restaurant on site. One of Scotland's newest distilleries, it was built in 2017 on a hillside overlooking Dingwall in Ross-shire and started full whisky production in January 2018. This community-owned distillery will be open to visitors in due course. Currently you are able to visit 'BaseCamp' in Dingwall High Street to learn about the area's whisky history and buy whisky/gin. This distillery is situated just outside Brora on the north east coast. It produces a rich, smoky, salty malt due to its seaside location. The current distillery dates from 1967, however the original Clynelish dates from 1896. It was briefly named Brora and closed in 1983. Interestingly the water from the Clynelish Burn from which it gets it water runs over rocks containing gold - and maybe this accounts for its rich amber colour. This distillery is the highest malt distillery in Scotland and is situated close to the A9 Perth to Inverness road just north of the Drumochter pass. It is owned by Diageo and is part of the Classic Malts. The cold climate here (where the mean temperature is 6 degrees Celsius) is ideal for producing whisky thanks to the cool fresh water from the Drumochter burn. Visible from the main road and from the railway line, Dalwhinnie distillery stands out due to its pure white paintwork which makes it sparkle in the sunlight. Its combined whisky and chocolate tastings are a truly unique experience. Visit Scotland 5 Star Visitor Attraction. Capacity 1.3 million litres and is open to visitors. Situated north of Inverness in the town of Muir of Ord, this Distillery has recently been modernised and boasts its own maltings. Historically the barley came from lands owned by the Mackenzies. Now owned by Diageo, 80% of the single malt produced at Glen Ord is used in the blending of the Dewar and Johnnie Walker brands. The best-selling Singleton of Glen Ord is marketed exclusively to Asia, with some bottles available for sale in the Visitor Centre but not in the rest of the UK. Visit Scotland 5 Star Visitor Attraction. Capacity 11 million litres and is open to visitors. This distillery is situated approximately 18 miles from John O’Groats in the town of Wick and is the most northerly mainland distillery. It ceased production in 1920 when Wick became one of the 56 Temperance towns. Production re-started in 1945. When launching a new range of Whiskies in 2010 owners Inver House Distillers decided to use names after the herring drifters which used to work out of Wick. More recently, the latest range has been named after three lighthouses in the area. So if you are visiting Orkney or just touring the far north of Scotland, then the Old Pulteney Distillery is well worth a visit. Capacity 1.8 million litres and is open to visitors. This is Skye's only surviving distillery out of the original seven. Founded in 1830, Talisker is not a heavily peated whisky compared to those from its southern neighbour Islay. Take a tour and see the 5 copper pot stills and the traditional worm tubs. Visit Scotland 4 Star Attraction. 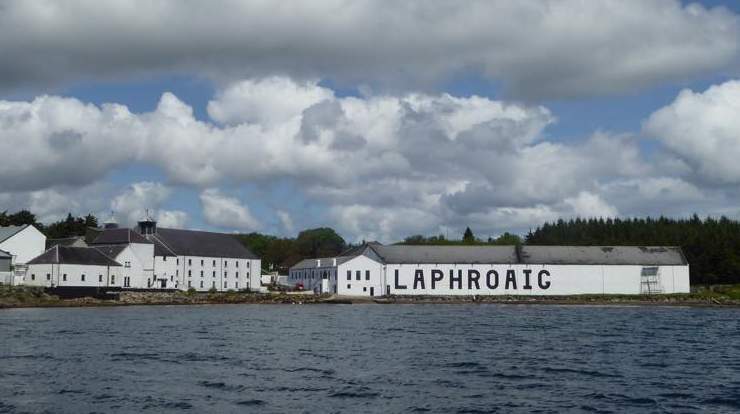 Opened in 2017, this new distillery aims to be producing whisky for sale by 2020. This small island off the coast of Skye had a long distillery of Illicit distilling - until now! Visitor centre and guided tours. Just off the A9 16 miles south of Inverness, Tomatin is described as “the softer side of Highland whiskies”. Tomatin’s first official distillery was opened in 1897, though there are indications of production in the area back as far as 1400s – drovers taking their cattle to market would stop here to fill their flasks from illicit stills! Capacity 5 million litres. Visitor centre open daily. Situated just outside Thurso on the north east coast, Wolfburn lays claim to being the most northerly distillery on the Scottish mainland. Founded in 1821 by William Smith, the original distillery fell into ruin and the new one was built in 2012. It is now in production and open to visitors for tours and sales. The Aberfeldy distillery was established by John Dewar, who was the son of a crofter. He was born just two miles east of Aberfeldy. As a young man John spent a spell working in the wine and spirit trade in Perth and in 1846 he started his own business. He was one of the first to produce a blended Scotch Whisky. In 1896 the Aberfeldy distillery was built next to the railway, providing a door to door link. The choice of site was also determined by the supply of water from the Pitilie Burn and the locally grown barley. Nowadays you can combine a visit to a distillery with Dewar's World of Whisky which celebrates the Dewar brand. Visit Scotland 5 Star Visitor Attraction. One of the oldest working distilleries in Scotland, Bells Blair Atholl Distillery was established in Pitlochry in 1798 when John Stewart and Robert Robertson, using water from Allt Dour (Burn of the Otter), founded their ‘Aldour’ Distillery. However due to the heavy excise duties of the time, their venture didn’t last long and the distillery soon closed. Revived in 1826 and soon taken over by Peter MacKenzie & Co, the distillery was acquired by Arthur Bell & Sons in 1933. Closed during the depression years and WWII, it was reopened in 1949 after modernisation. 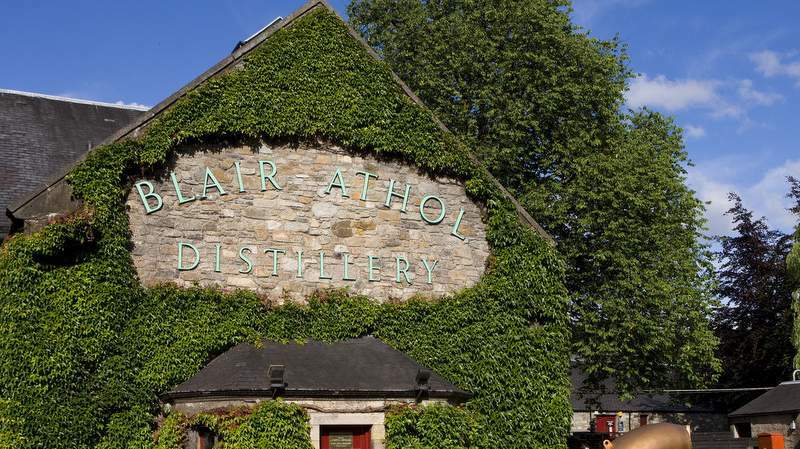 Their 12-year-old Blair Athol single malt whisky is known for its deep mellow smooth finish and their contribution to the Bell’s Blend, the UK’s most popular blended whisky, is much appreciated. One of the smallest distilleries in Scotland, its main claim to fame came after the sinking of the SS Politician in 1941 when 200,000 bottles went down off the Outer Hebrides. This later inspired Compton Mackenzie's story Whisky Galore which became a popular film. Visit Scotland 5 Star Visitor Attraction. The Famous Grouse Experience at the Glenturret Distillery is the oldest working distillery in Scotland and has become a very popular, award winning 5 star tourist destination. Situated on the edge of the town of Crieff “The Famous Grouse Experience” is just that with plenty to enjoy for all the family at the interactive experience as well as during the distillery tours and in the lovely café. It’s the spiritual home of the Famous Grouse whisky and producer of the Glenturret single malts. This small distillery is set in the Ochil Hills close to the A9 main route north/south. It has a long history, its latest episode being from 2011 when an independent family company took ownership. It welcomes visitor tours and has a shop. It produces single malt whisky using the local water from the nearby hills – the same water source which is bottled as the now well-known Highland Spring Water. With its limited availability and its difficult name (pronounced "cull-eela") it has been almost a secret Islay malt. The Gaelic word Caol is in English "kyle" meaning "sound" (a narrow strip of water) so Caol Ila means "Sound of Islay". The distillery hidden in a cove near Port Askaig overlooks the Sound of Islay, across which the ferry chugs to the nearby island of Jura. The water source for Caol Ila is the peaty Loch Nam Ban about a mile away from which the water flows through fields, arriving at a waterfall near the distillery. The six stills are large and lantern shaped. Caol Ila was built in 1846, reconstructed in 1879 and rather brusquely modernised in the 1970s. A neighbour of Laphroig and Ardbeg, with the sea on the doorstep, Lagavulin produces heavily peated whisky, but with a personalised style. For decades now, Lagavulin has been seen as one of the great single malts of the world. It has therefore been easy to overlook the importance that the whisky has had (and to some extent still has) for the White Horse blended scotch. Lagavulin is the oldest distillery on Islay having been founded in 1742 from the merging of several smugglers bothies. Capacity 2.4 million litres and is open to the public. This distillery was founded in 1810 and re-built in the 1950s. After various owners, it is now in the hands of Whyte and Mackay which is part of Emperador Inc and the Philippines Alliance Global Group, the second largest spirit brand in the world. The Isle of Jura's remoteness provides a romantic note for its visitors who are able to enjoy its natural beauty, scenery and wildlife and take part in walking, climbing and exploring. The distillery sponsors the annual Isle of Jura Fell Race. Glenkinchie is situated close to Edinburgh and represents the lowlands with a good, light, quality whisky . Here you will find the museum of Malt Production. Along with five other Lowland distilleries, Glenkinchie in 1914 formed Scottish Malt Distillers, which later merged with another group to form the Distiller’s Company Ltd which went on to become Diageo. Being close to Edinburgh, this distillery is very popular with tourists and attracts around 400,000 visitors per year. Visit Scotland 5 star attraction. Situated on the outskirts of Glasgow, the single malt made here is triple distilled and light. The present site was once a monastery. Legend has it that the monks turned their hand from brewing beer to making whisky after the dissolution of 1560. The distillery was licensed in 1823. In recent years sales of Auchentoshan have increased dramatically and have now exceeded 1 million bottles per year. Visit Scotland 5 star visitor attraction. Opened as recently as 1995, this distillery has quite a few achievements already: named Distillery of the Year in 2007 by Whisky Magazine and Best Single Malt 12 years and under in Jim Murry’s whisky bible. Like many distillers in Scotland, Arran distillery is undertaking expansion but slowly in this case due to the pair of golden eagles which are nesting on the mountain behind the distillery. Great care is taken not to disturb them. Said to have been founded in 1817 and kept in the same family until 1930, Bladnoch has had several owners since then. Rescued by an Australian entrepreneur in 2015, it is hoped to have a visitor centre open to the public in May 2019. Capacity 25 million litres. Not currently open to visitors.